As a senior high teacher, my husband Paul is often asked to write reference letters for his students. When I asked him once if he's ever asked by a student he doesn't feel he can write a positive reference for, he said he has been and he always tells them that he'll write it, but he'll be honest. Generally, though, the ones he wouldn't be able to write a positive letter about don't ask him for one. I'm not sure how long job/school related reference letters have been around, but I can remember reading in 18th century books about 'letters of introduction.' These letters were written by people of influence and given to someone who was traveling, to allow them to gain access to people of influence where they were going, based on the introduction in the letter. It was essentially a social reference letter, I guess. There is a man mentioned in the Bible named Demetrius, about whom we know almost nothing. What I find interesting, though, is that the brief mention of him sounds remarkably like either a reference letter or a letter of introduction. "Demetrius is well spoken of by everyone—and even by the truth itself. We also speak well of him, and you know that our testimony is true" (3 John 1:12). That's all that is said about him. We're not told why John mentioned Demetrius to Gaius (the recipient of the letter that is 3 John), or what Demetrius has done to deserve this positive reference. While studying about this verse, I read speculation that maybe Gaius already knew Demetrius, so this was simply an update about him, or maybe Demetrius was the one carrying the letter from Paul to Gaius. There was even mention that perhaps this is the same Demetrius who riled up the artisans in Ephesus against Paul (in Acts). He was well spoken of by everyone. Sounds like he could have asked anyone in town for a reference letter, doesn't it? Now, sometimes, being spoken well of by everyone means you're trying too hard to appease everyone and not holding firm to any convictions. A person like that will do anything to keep people happy and thinking well of them. That doesn't appear to be the case with Demetrius though. Even the truth itself could speak well of him. This speaks to Demetrius' willingness to hold firm to his convictions as a Christian. He wasn't the type to just go along with anything in an effort to make people happy. But when he disagreed with something or someone, he likely did so with compassion and kindness, rather than judgement and condemnation. John knew Demetrius personally, and shared the general good opinion of him. It is one thing to have the general good opinion of 'everyone', and quite another to have the good opinion of one specific person who knows you personally. When John says to Gaius, "and you know that our testimony is true", I take that to mean that Gaius would know that John doesn't just hand out these sorts of references lightly. John was speaking from personal experience with Demetrius and that experience had left John with reasons to give Demetrius a positive reference. Would we be able to receive such a reference letter? Do we have the good opinion of everyone around us? Or are there people who could rightly say we are difficult, judgemental, condescending or negative? Are there those who would claim we think we are 'better than them' in some way? It's not that we should be seeking to make everyone like us all the time, but that they should not be able to speak negatively about our character. Would the truth be able to speak well of us? Do we live out what we believe no matter who is around? Or do we go along with things we believe are wrong in the interest of having people's approval? Do we sometimes act like it is more important to have the approval of people than to have the approval of God? And lastly, what about the people who know us the best, the ones we live with or work closely with? They're often the ones who see the worst of us, aren't they? Would they be able to say that they too speak well of us? Who we are in daily interactions with the people around us affects not only how they see us, but also how they see the Gospel we say be believe. What kind of reference letter would they give us? 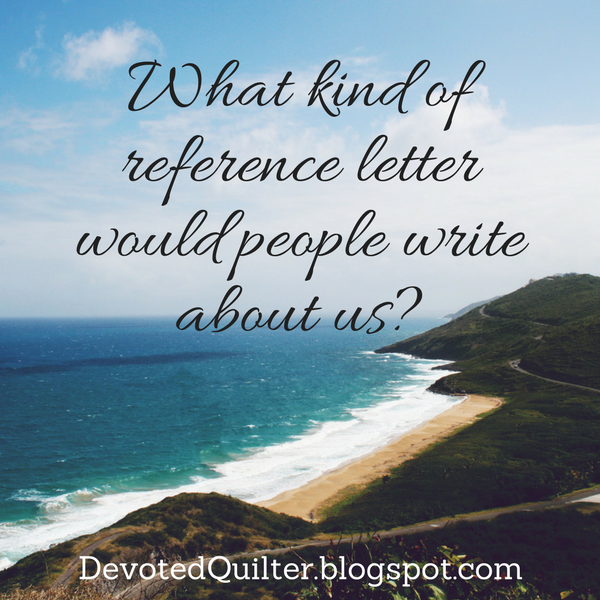 This post made me stop and ask myself what kind of reference letter would I receive? Thanks for writing this, and for reminding me that someone IS always watching. It's a very thought provoking post.